Except our bags aren’t packed and we’ve still got a week to go. And no, we’re not ready. The first bags – the big crates – are being packed today and they’ll be on their way to Houston tomorrow. Personally, I think it could all wait until next week because Houston is about a four-hour drive away. But then my opinion wasn’t requested and I’m pretty sure that’s a good thing. There is still a big stack of quilts in my office that are going to Quilt Market – at least that’s the plan. I had the flat surface on which to put the stack, and the space for them to not be in the way. There is a stack of boxes in the hallway that will be packed with items to be shipped to the fabric designers – these will have things they won’t need at Market so it’s shipped instead of their having to stuff it into their luggage to take. There are also name badges and badge-holders to mail – they’ll need those in Houston. That’s fabric that arrived… it’s something new to debut next week. 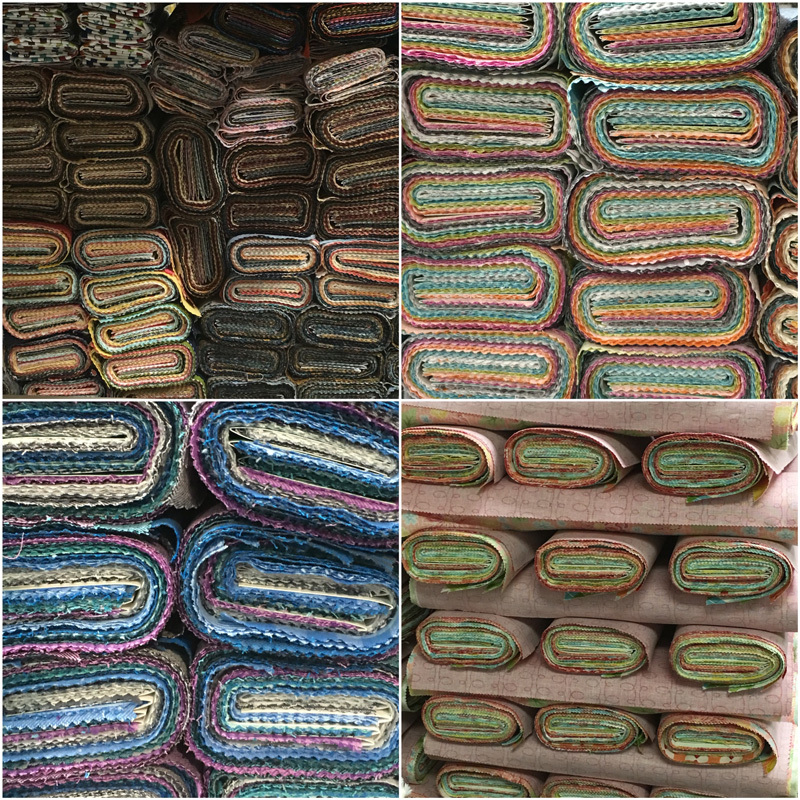 The capsets-headers for the Market collections that the Reps will use to show the fabrics are ready to go – but you knew that, right? But what about the fabric designers? What’s going on with them the next ten days? Sewing. Sewing. Packing. Some shopping. Sewing. Showering – hopefully. Eating – when possible. Sleeping? Not likely. More sewing. You think I’m kidding? 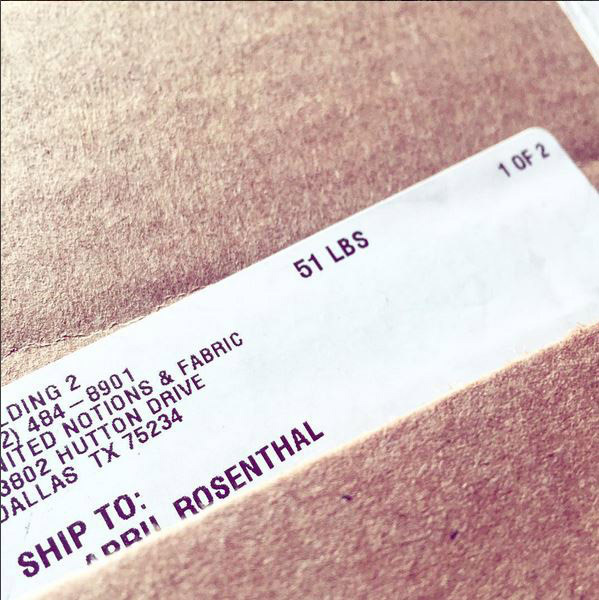 Ask April Rosenthal – she had 68 pounds of fabric delivered on Friday. Four days ago. That means she will have less than two weeks to make her quilts for Market. And take care of sweet little less-than-five-month-old Hazel. 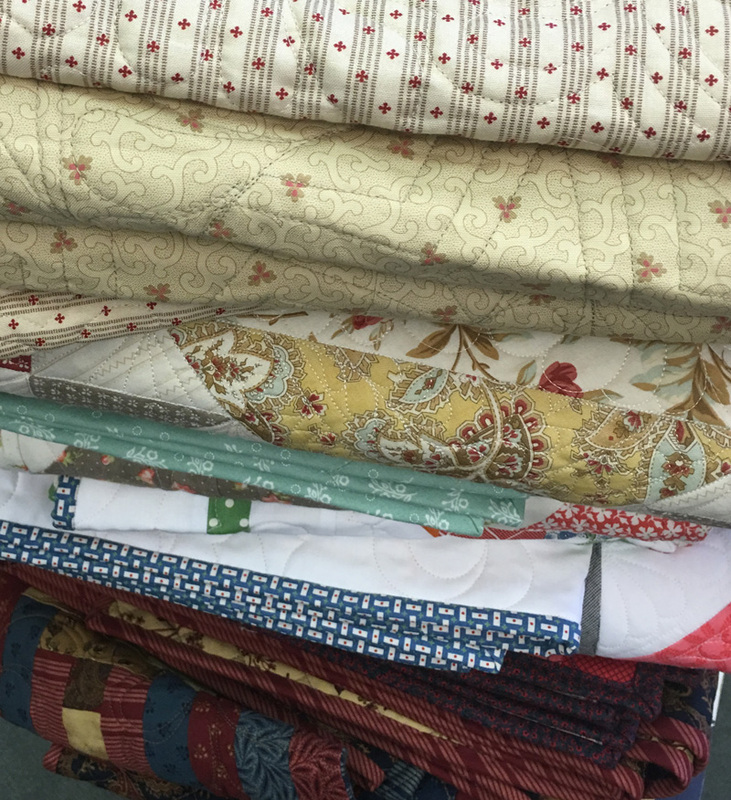 For those than have pre-Market collections – collections that were shown to shops before Quilt Market – life is a little easier. 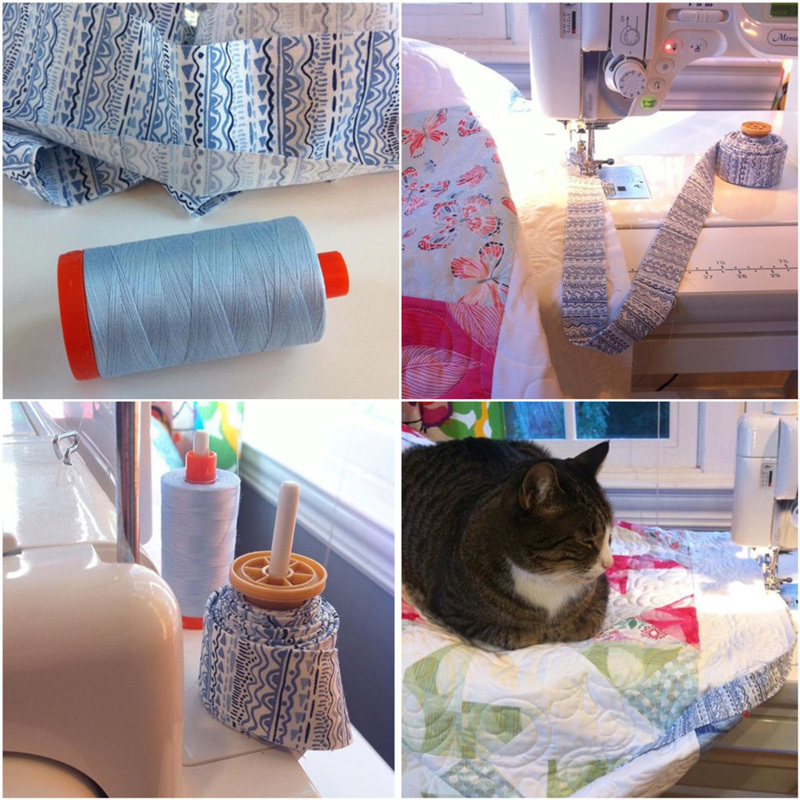 Their quilts are made – though I think a few are only now being bound… like Kate Spain’s Aria quilts. Are they ready? No. But only because I don’t think anybody who does this is ever as ready as they want to be. You’re as ready as you’re going to be – everybody always wishes they had time to make one more quilt, bag, pillow, whatever. It’s a last-minute scramble to get things shipped for those who have an actual booth of their very own. If you’re wondering what the difference is, it’s mostly the amount of stuff that needs to be brought/sent to Quilt Market. The designers in the Designer Studio have less space than a single 10′ x 10′ booth, and only one wall to worry about covering. A “booth in a bag” is sometimes possible – all the quilts and projects you want to show will fit into a large suitcase. Or two. Yes, Southwest is a popular “going to Quilt Market” airline because of that two-bags-for-free policy. So that’s what’s going on with Moda and the folks here. I thought I’d be more ready but like everyone else, I keep thinking this time will be better. And I’ll start getting ready earlier next time. I think that means if I want to be ready for Spring Market next May… I should have started getting ready in 2003. Here’s hoping Southwest has gotten its computer glitch fixed so you’ll have clear sailing/flying for your fabrics in your checking allowance! Question: on your quilt stack , please tell me the pattern line for the third quilt. It looks really pleasing. We quilters so appreciate all the hard work that goes into having a great market. Thank you all. Where is the Moda warehouse and is it open to the public. Hi Bonnie – The Moda warehouse is located in Dallas, Texas and I’m sorry, it’s not open to the public. What an exciting time! And busy! 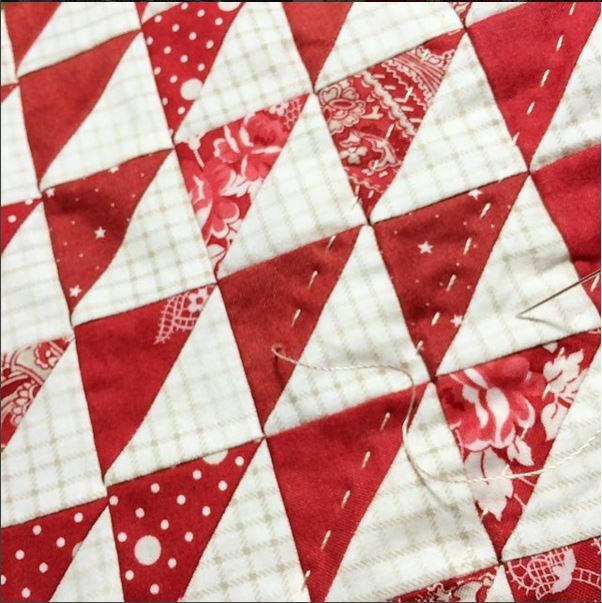 Can’t wait to read your posts about market and see all the photos of the beautiful quilts and fabric! I loved the cat on the quilt. My cat, Rosie, also sits on my quilting while I am working. I think she just loves the purr of the machine! What an exciting time in the Moda designer world! 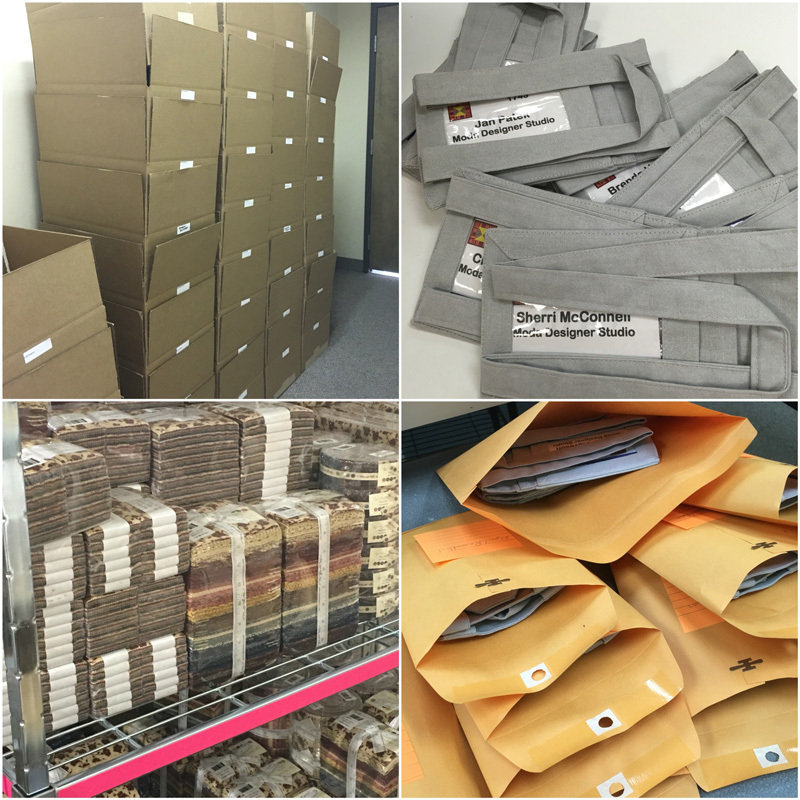 Love your post…..You know what….everything that is important will get done, and the rest….well, just don’t worry about it! 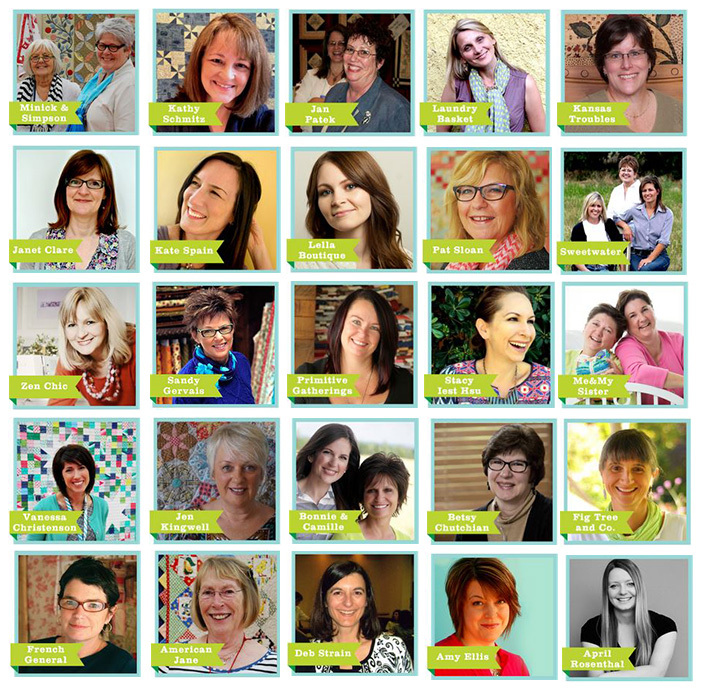 Safe travels to you and all those going to Quilt Market….and, HAVE FUN!! Ditto that, safe travels, have fun, make money and save some fabric for us. Sounds like fun along with all the craziness – wow! We all appreciate the hard work and thanks for sharing so we can see some of the many deadlines you all must face! Can’t wait to hear all about it soon!